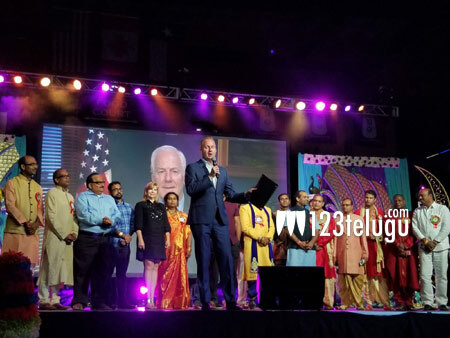 Dallas-Texas: Over 12,000 people attended TPAD’s biggest and most spectacular Bathukamma and Dasara celebrations in USA. Dallas has it! From weather to the culture from people to the festivities. 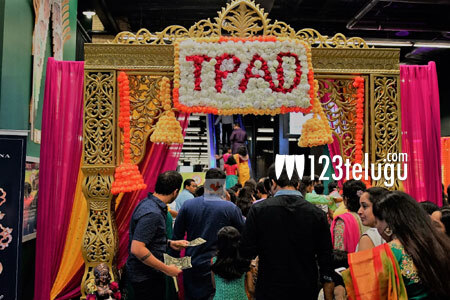 Leveraging the strengths Telangana Peoples Association of Dallas (TPAD) organized one of the biggest shows of Bathukamma and Dasara celebrations outside of Telangana. It was a day long festivity but surely a yearlong planning. The venue said it – Dr. Pepper Arena in Frisco home to some of the largest and finest shows that happen. The venue was indoor, nevertheless the weather lent credence to the overall celebrations and all roads led to the venue. The enthusiasm was visible as people came as early as 11.00 AMand stayed until midnight. The festive look, the mystic air and the preparations set the right tone for the huge program underway. Women were at their pinnacle best with colorfully donned Bathukammas and were singing and dancing to the Bathukamma tunes. The organizers ensured no stone unturned for the attendees to have gala of time. The cultural activities were planned diligently so the audience would enjoy throughout. From folklore to classical, trendy to frenzy the participants showed their prowess. However the best of the program was yet to come during the prime time show. Over 1500 women formed gigantic circles while the beautifully adorned Bathukammas were centrally placed. 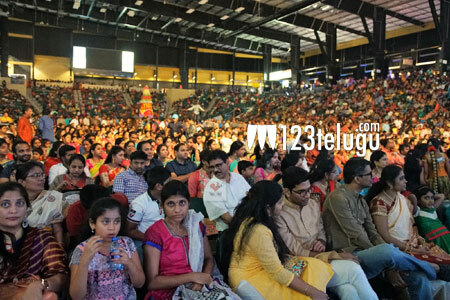 As the live beats and the traditional Bathukamma songs were being played, it was nothing short of a festival you wanted to be at. At the program City of Frisco proclaimed September 30thas TPAD Bathukamma day and the proclamation was read and announced by the Mayor Jeff Cheney. Mr. Upender Telugu (Foundation Chair), Mr. Ashok Kondala (BOT Chair), Mrs. Madhavi Sunkireddy (Coordinator), Mr. Karan Poreddy(President) along with Foundation members Mr. Ajay Reddy, Mr. RaghuveerBandaru, Mr. Rao Kalvala, Mr. Janaki Mandadi, Mr. RajavardhanGondhi and Mr. MahenderKamireddywelcomed the audience for the biggest happening Bathukamma, Dasara celebrations and thanked each and every one for being part of the most happening event. The cultural activities were planned diligently so the audience would enjoy throughout. From folklore to classical, trendy to frenzy the participants showed their prowess. 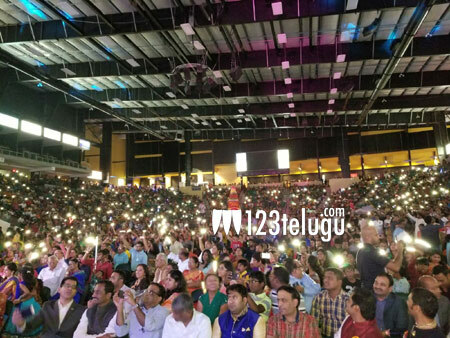 The cultural program line up included singer Deepu, Sameera, Sai Shilpa, Actresses Regina Cassandra, YaminiBhaskar, Amulya, Sravani and the famous anchor Laasya, people of all ages danced to every song. The event planning was done by Board of Trustees, Ashok Kondala (Chair), Manohar Kasagani (Vice Chair), Madhavi Sunkireddy (Coordinator), RamAnnadi, IndraniPancharupula, PavanGangadhara, Praveen Billa, RajenderTodigala, Rao Kalvala, Janaki Mandadi and RajavardhanGondhi. The event was executed flawlessly by Executive Committee members Karan Poreddy(President), Sudhakar Kalasani (Past-President), Ramana Lashkar (Secretary), Chandra Police (Joint-Secretary), Linga Reddy Alva (Tresurer), RavikanthMamidi (Joint-Tresurer), RupaKannayagari, RojaAdepu, SriniGangadhara, Srinivas Vemula, SurenderChintala, Satya Perkari, SharathYerram and Satish Janumpalli.